The catalog of products that we put before you, is the result of the fusion between the long experience that the agriculture has given us, as well as the results extracted over the years from the different crops on which we have worked. The challenges that have been presented to us have helped us to improve the development and production of our products and we have been able to give shape to this catalog which will help you to solve different agricultural needs. The trust that we are given generates the greatest commitment to all of you, so that our products are a guarantee of quality, innovation and development with the utmost respect for the environment. We turn our efforts on this as our primary objective. In order to be up to the needs of today’s modern and ecological agriculture, we are certifying as ecological, an extensive group of manufactured products from our line, some already common and others of new creation. In this way we can guarantee their use in Ecological Agriculture. 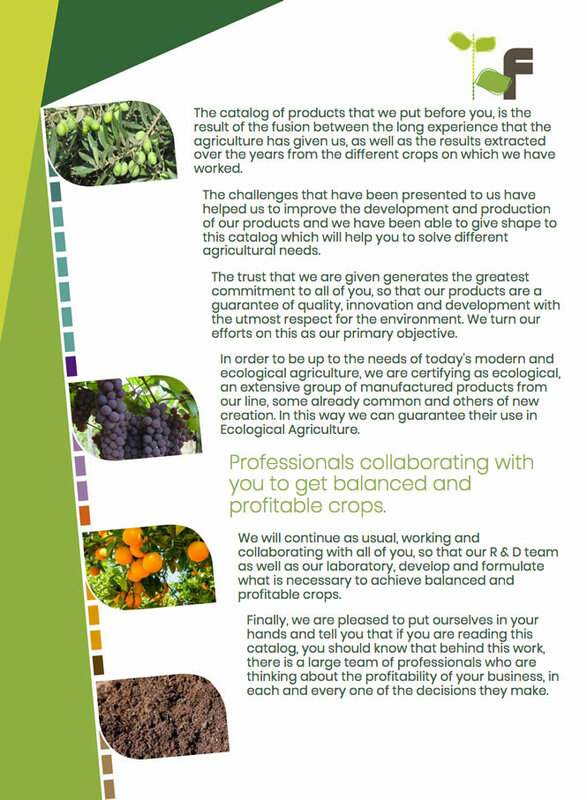 Professionals collaborating with you to get balanced and profitable crops. We will continue as usual, working and collaborating with all of you, so that our R & D team as well as our laboratory, develop and formulate what is necessary to achieve balanced and profitable crops. Finally, we are pleased to put ourselves in your hands and tell you that if you are reading this catalog, you should know that behind this work, there is a large team of professionals who are thinking about the profitability of your business, in each and every one of the decisions they make.